Send warm wishes for the holidays with a magnificent assortment of colors and textures. 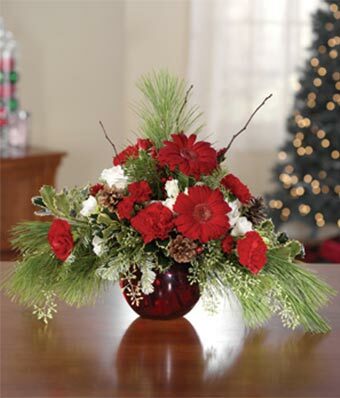 Red miniature carnations and gerbera daisies, white freesia and spray roses, pine cones, lush winter greens and more, are all gathered in a hand-blown glass bubble bowl to become the perfect Christmas flower arrangement. Measures approximately 18"H x 24"W x 14"D.